Scientists have allowed rats to turn their thoughts into direct messages. For every ounce of wonder and knowledge the field of neuroscience gives us humans, it could be reasonably argued that it gives the rodent world twice the amount in nightmares. 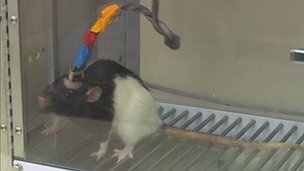 In a fresh twist on this theme, a team from Duke University Medical Center in North Carolina has done something wonderful, albeit confusing, for our small and furry friends: They have managed to allow two rats to communicate directly over thousands of miles using cables implanted into their brains. Detailed in the journal Scientific Reports, the brain-link works by patching into the sensory- and motor-sensitive parts of the rats' brains and then linking them up, allowing the two creatures to share information from those signals with one another. The patching-in is done with an array of microelectrodes, each measuring roughly one hundredth of the diameter of a human hair, implanted directly into the brain. The scientists behind it demonstrated the effectiveness of the system using a fairly simple-sounding experiment. Two rats were stationed in boxes that contained two switches, two lights, and a water bottle. The switches were located beneath the lights. Rat A, the encoder (sender of information), was trained to know that pressing one of the two switches when the light above it was illuminated would earn it a sip of water from the bottle. Rat B, the decoder (receiver of information), was not given this information; additionally, its box didn't have the handy-hint lights fitted to the box of Rat A. For added assistance, a feedback system that denied Rat A its water if Rat B chose the wrong switch was also put in place. Simple, right? Here's the cool bit: When the two rats were hooked up with a brain-link, the scientists found that Rat B was able to learn the behavior needed to get sips from the water bottle using only information passed on from the brain of Rat A. With no assistance from its minders and no hints from the lights above the switches, Rat B was able to hit the right switch at the right time and earn itself a drink around 70% of the time. To further prove their point, the team then repeated the experiment using one rat housed in North Carolina and a partner rat housed at the University of Natal in Brazil. As before, the decoder rat was able to pick the right water-switch thanks to its handy brain-link with the trained encoder rat. "[It] takes about 45 days of training an hour a day [to get the experiment to work]," said Professor Miguel Nicolelis, who led the team behind the brain-cable. "There is a moment in time when... it clicks. Suddenly the [decoder] animal realizes: 'Oops! The solution is in my head. It's coming to me' and he gets it right." Depending on how you feel about biotechnology and the future of human communication, it might be that you're thinking this could be a useful thing for human beings to become involved with. If so, and provided non-invasive techniques for getting deeply involved with human brains are possible, Nicolelis has good news on for you: "We will have a way to exchange information across millions of people without using keyboards or voice recognition devices or the type of interfaces that we normally use today," he said. "I truly believe that in a few decades... we will know what it is to communicate in that way," concluded Nicolelis. Can you imagine that? The mind (privately, for the moment) boggles. It's tempting to wonder how the rats are taking this; can they sense the other rat, or do they just feel their limbs moving towards the right switch? Either way, your sacrifice in the name of the human networks of the future will not be forgotten, cable-brain-rats. Enjoy the water while it lasts.